The Jump Special Anime Festa 2018 event announced additional cast and staff members for the Yakusoku no Neverland (The Promised Neverland) TV anime on Sunday. The series will premiere on Fuji TV's noitaminA programming block in January 2019. Amazon's Prime Video platform will also stream the anime exclusively. The event also pre-screened the anime's first episode. The opening theme song will be performed by rock band UVERworld. The fantasy thriller manga has been serialized in Weekly Shounen Jump since August 2016 and has 11th volumes in print as of November 2. Shueisha plans to publish the 12th volume on January 4, 2019. 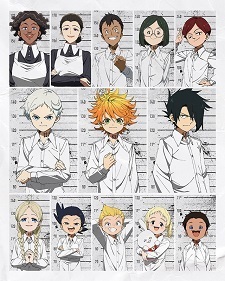 Yakusoku no Neverland has a cumulative 8.7 million copies of its compiled volumes in print. VIZ Media published the first three chapters of the manga in English simultaneously with the Japanese release as a part its Jump Start initiative, and has since been serializing the series in their digital Weekly Shonen Jump magazine. The seventh volume is scheduled to go on sale on December 4. I'm usually fine with UVERworld but its a dumb choice for this one. Didn't expect Uverworld for this, they usually do action anime. Hopefully the song is good. Airing on Thursdays at 24:55 (Fridays 0:55 a.m.) via Fuji TV, Iwate Menkoi TV, Sakuranbo TV, followed by Sentai Housou, Fukushima TV, Niigata General TV, TV Shizuoka, Toukai TV, Kansai TV, Akita TV, TV Ehime, TV Shin Hiroshima, TV Nishi Nippon, Saga TV, TV Kumamoto, Kagoshima TV, Nagano Housou, Kouchi Sansan TV, and BS Fuji starting January 10 (11 midnight), 2019. Amazon Prime Video will also make first ep. available one day prior. First 15 mins. of the first ep. will be available before it starts airing on TV with a QR code that will include in Vol.12 releasing on January 4, 2019 and can get before January 9.